Description: Refugees in Backnang, "Lunchtime. 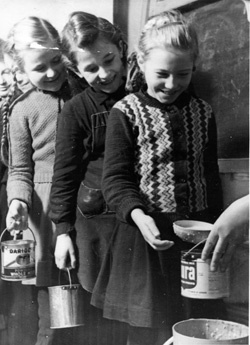 Powdered milk, sent over by the American Mennonites, provides nice lunch pails for the children." Description: Refugees in Backnang, "The Backnang camp seamstresses busily patching, mending, and fashioning new clothing."